My daughter is a huge crafter. She loves creating art and exploring her imagination. From creating stories to making new fashion designs and creating art to hang on her wall, her creativity always amazes me. She's also a big fan of the DohVinci Art Sets. She received her first kit last year for her birthday and has been loving them ever since. So I knew she would love their Butterfly Wall Art Kit. If you aren't familiar with Doh Vinci, it's somewhat like a play-doh, only easier to use when creating 3D art designs. It comes with a styler and deco-pop tubes with different bright colors to help create beautiful creations. The Butterfly Wall kit comes with an 8-piece butterfly project and 4 Deco Pop colors for you to create beautiful butterfly wall art pieces to hang separately or string together on your child's wall. It's easy to use and since my daughter is 10, once she started creating, she put on her headphones to listen to some music and was in her own world designing her butterfly pieces. Once she was done she wanted me to keep the pieces for her because she wants to display them in frames to hang up in her room. What I love about DohVinci is that although it's somewhat like play-doh, it's easier to direct and create beautiful 3D pieces of art. There are many different designs to choose from. I recommend buying the original set to start off so that it comes with a styler for your child to use, that way when you buy different refill sets, you don't have to buy the styler separately. For more information about the Butterfly Wall Art Kit and other DohVinci products be sure to head over to www.hasbro.ca. Disclosure: All opinions are my own. 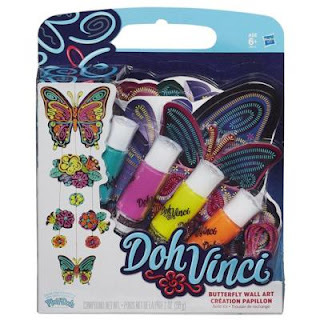 I received DohVinci Butterfly Wall Art Kit at no cost for the purpose of this review. No other compensation was received. Reviews are the great way to get good services and products like this. Now review could be see for anything. To watch a film also person are reading reviews first.